When I saw this Hopi proverb on Twitter recently, it immediately evoked memories of the time I spent earlier this month in El Salvador on the Unbound Blogger Trip. Of mothers and fathers who, because of Unbound sponsorship, knew that their child could go to school. Of mothers who held one another accountable in “solidarity groups,” where women learned skills that would help them support their children. Of aging people such as blogger Ali Ebright’s sponsored individual, Josefa, who can now be assured of sufficient food, adequate shelter, and community support. Christopher and Silvia both live in El Salvador, and need to be lifted up by the support of Unbound sponsorship. Christopher has been waiting for Unbound sponsorship since June 2013. His mother and father both work very hard to provide for him, but their incomes are not consistent enough to ensure that he receives the benefits sponsorship can give, such as nutrition, health, clothing, and (when he is old enough) education. Silvia is a 22 year old woman with special needs (she has had epilepsy since birth). 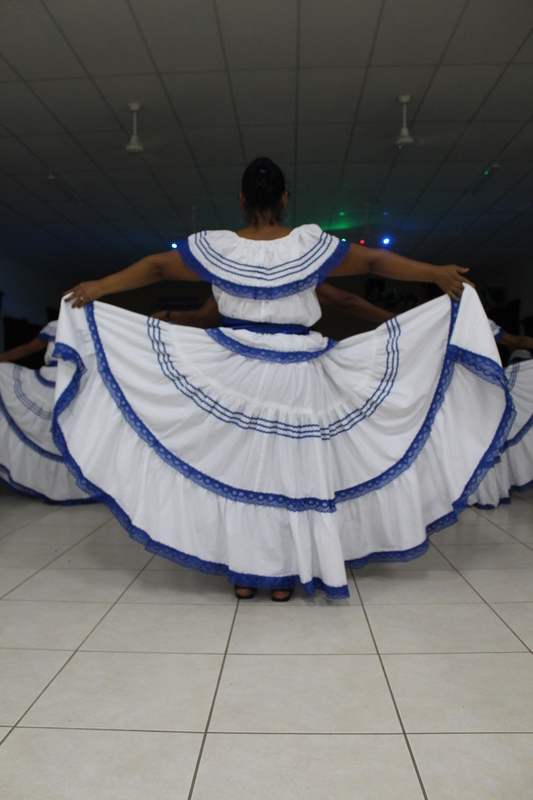 She was sponsored for three years but her sponsor left the program. [Note: she has continued to receive her benefits through a contingency fund but she would thrive off of a relationship with a sponsor.] She lives in a 7-person home; this family subsists on $60.00 a month. She loves to play with toy cars. I would love to know she can get the most basic needs of food, health, and shelter met. I recently read an article written by Rev. Kyle Smith, who is preparing to be a priest. He talked about how, when he elevates the chalice, “My thought and prayer … is … ‘Wow, who am I to be this close to Christ present in the Eucharist? '” He goes on to look forward to his priesthood, and “how more powerful an experience it will be to say the words that call down the Holy Spirit and make Christ present.” In my experience as a sponsor, and in every interaction I had during the Unbound Blogger trip, Christ was made present in tangible, daily ways even though we were not in a formal place of worship. 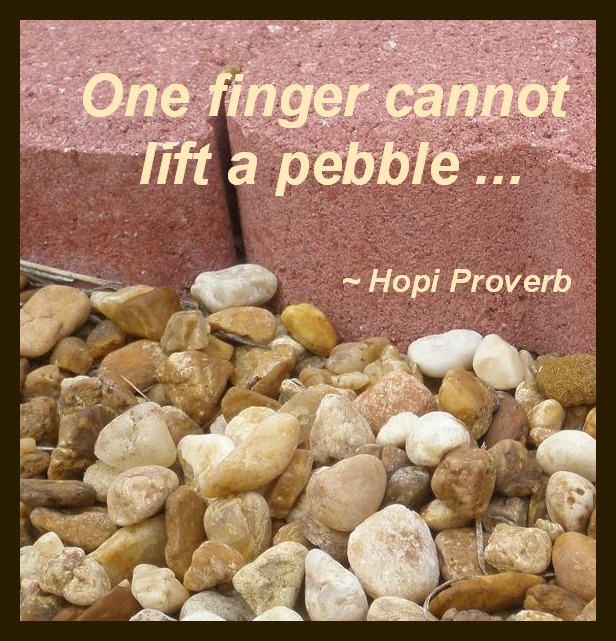 Christopher and Silvia are like the Hopi’s pebble … it is going to take more than one “finger” to lift them. They need their families; they need (and have) a God who loves them. Ultimately, they need someone to help lift them through the support of sponsorship. For more information on sponsoring Christopher or Silvia (a $30 a month commitment), please visit this link. If you are not prepared to sponsor right now, please know that your prayers are powerful, as is your willingness to share information about the work of Unbound among people you know. It is not just Christopher or Silvia who will be lifted by Unbound sponsorship. Whoever sponsors them will also discover their heart soaring to new heights. 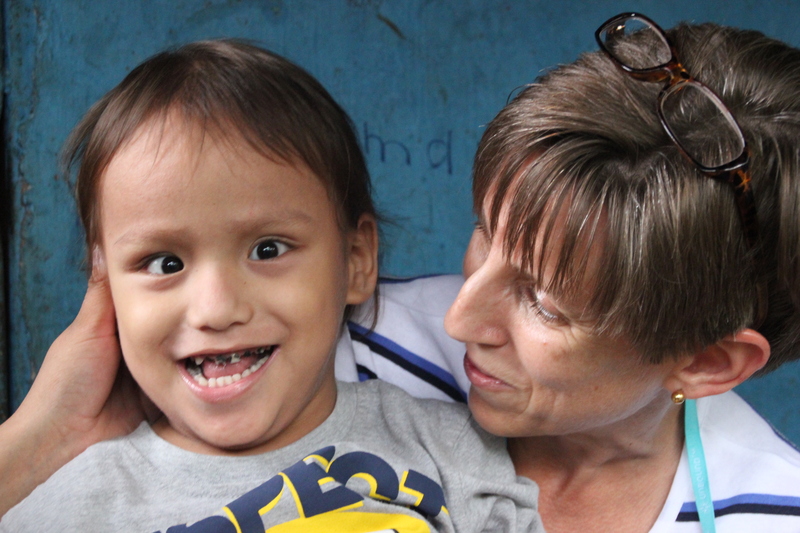 One of our sponsored children, Stanley, who lives in El Salvador. Today is Pentecost, so I have seen many references to fire throughout the day, including “igniting the fire, kindling a fire,” and other fire-related phrases. These phrases took my mind back to last week’s visit to El Salvador’s communities as part of the Unbound Blogger Trip. Blogger Ali Ebright cooks huisquil with Maria. As a result of the challenges faced by the families served by Unbound, the process of preparing to cook and then actually cooking the family’s food can be arduous. Imagine having to scavenge outdoors for wood in order to provide for your family. Imagine wood that is soggy from the frequent rains during rainy season (May through October). It is relatively simple for most of us in the US to prepare meals for our families (turn a dial, light the grill, give in to exhaustion and visit a drive-through). The aisles of a typical American grocery store overwhelmed me with their excess of variety and options upon my return from El Salvador. We have ease, abundance, and social programs that attempt to make sure no child goes hungry. Some fires take a lot of planning, labor, and good fortune to light. Some are ablaze so rapidly that it’s impossible to define the moment of ignition. 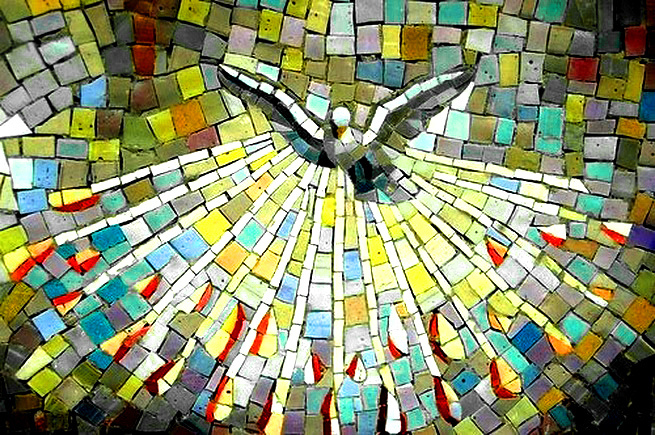 Of course Pentecost isn’t about a single mom in El Salvador seeking enough dry wood to make a cookfire. But it is in attending to these small details of living that we can tangibly reflect the Holy Spirit alive in us. These families in El Salvador who are involved in Unbound, 85% of whom are headed by single mothers, do not have lives that anyone would consider “easy.” What they do have is one another. I heard testimony after testimony of the impact Unbound had on families: children who had adequate food, students who could keep going to school instead of dropping out to work, aging adults who had the support that is so frequently nonexistent. I saw mothers’ groups holding one another accountable and managing “cooperatives” where very small (in the scheme of things) loans were granted to help them start businesses and create better lives for their children. 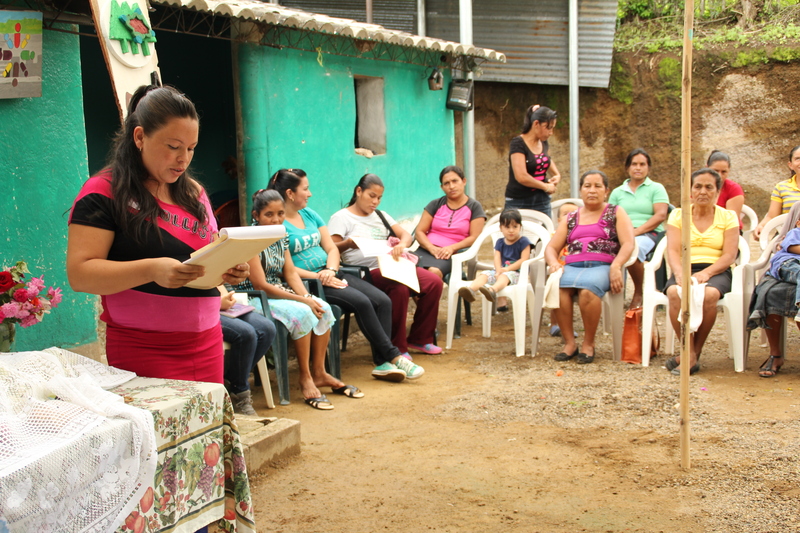 A Mothers’ Group in Las Lomas. I have volunteered frequently at churches where priests are giving a homily about Unbound, after which parishioners are invited to review folders of children and aging people who are awaiting sponsors. I am convinced if I could by some feat of time travel drop the entire congregation into an Unbound project in El Salvador (or any of the 20 other countries served by Unbound) for just 15 minutes, they would come away with new sparks of understanding and interest in Unbound’s work. This is not to take away from the priests’ work; it’s just different when you look these people in the eyes. Unbound is not about handouts; it is about people who have the dedication and desire to improve their lives who need resources and support to do so. I know the $30 a month cost of sponsorship, as reasonable as it is, is prohibitive for some of you. There are other ways to give: a one-time donation to the scholarship fund, for example. If nothing else, your prayers are welcome. This is a big project serving people with big needs; prayers can most certainly help a strong program remain so. Today’s scripture spoke of “divided tongues.” In our week in El Salvador, we didn’t all speak the same language (thank you, interpreters for your help with THAT!). But we shared a commitment to fanning the flames of community, support, and compassion that underlie each Unbound project. Flames that will forge dignity for each participant. 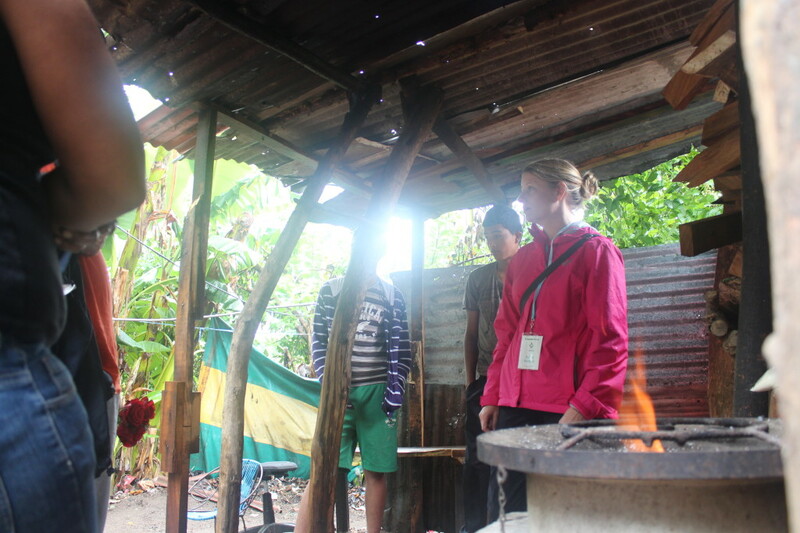 *Note: I gathered these facts about eco-stoves from ENLACE El Salvador. I do not know what brand of eco-stove Ali saw.